Et Verbum: The Condition of the Suffering souls in Purgatory, by Rev. John A. Nageleisen. On the Means of Relieving the Suffering Souls. Part 17. 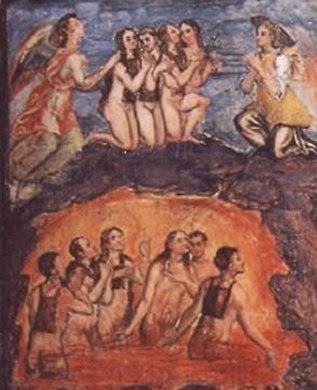 The Condition of the Suffering souls in Purgatory, by Rev. John A. Nageleisen. On the Means of Relieving the Suffering Souls. Part 17. § 33. Value and Importance of Holy Mass for the Release of the Suffering Souls. 170. In our mortal state we are unable to comprehend the torments of the Suffering Souls; but the time may come when we shall be taught their intensity by our own dreadful experience.—Hitherto we have heard the doctrine of the Church, of the holy Fathers, and of theologians in general concerning Purgatory ; we have seen that many souls had to suffer long for a venial fault, and that even saints did not escape the purifying flames.—The Venerable Catherine Palluzzi continued for a long time to offer up with great solicitude all her good works for the repose of the soul of her deceased father. Finally she thought she might cease her supplications, when our Lord and St. Catherine appeared to her and conducted her to Purgatory, where to her great astonishment she beheld her father in the midst of a fiery lake, imploring her for help. She nearly fainted from compassion, and called on St. Catherine to aid him by her prayers. Then she turned to our Lord Himself, saying, "I beseech Thee to impose my father's debt on me. I am ready to bear whatever Thou wilt impose on me to make atonement in his stead." In consequence of this magnanimous offer her father was released immediately, but she had to undergo great sufferings. 171. We firmly believe that our prayer, and still more the prayer and suffrages of the Blessed Virgin Mary and the saints bring relief to the Suffering Souls. But what is the prayer of heaven and earth compared with Holy Mass ? In prayer a creature intercedes for a creature; in Holy Mass Jesus Christ, eternal God like His Father, makes intercession for us. Speaking of the value of this Holy Sacrifice, St. Alphonsus Liguori says, "As the passion of our Lord Jesus Christ was more than sufficiently powerful to redeem the whole world, so also is one Holy Mass powerful enough to save it." We have recourse to Holy Mass not for the purpose of renewing the redemption of the world, but to procure for the souls confirmed in grace the treasures of redemption. This august Sacrifice is undoubtedly the most powerful means to release the Holy Souls from their place of torment. This is solemnly declared by the Council of Trent, saying, "The ecumenical Council teaches that there is a Purgatory, and that the souls confined therein are assisted by the suffrages of the faithful, and especially by the Holy Sacrifice of the altar."—St. Thomas Aquinas teaches, ' 'There is no sacrifice by which souls are released from Purgatory, except the Holy Sacrifice of Mass." 172. By Holy Mass sufficient payment is offered to our Heavenly Father to cancel the indebtedness of the departed. Every soul in Purgatory is an elect child of God, confirmed in His grace and love; for every one became reconciled to Him by contrition, confession and penance. But as they have not rendered sufficient satisfaction for all temporal punishments, they must suffer the penalty now. They incurred punishment by small daily offers and faults, and are detained in prison for the purpose of purification. Our Lord warns us to beware of this prison from which we shall not be released until we shall have paid the last farthing. A just judge will scarcely release a prisoner who is confined on account of debt merely because he is implored to do so; but if the debt is canceled by vicarious payment, he will free the prisoner. The Suffering Souls, beloved spouses of Christ, writhing in excruciating torments, are unable as yet to attend the wedding-feast already prepared for them, because the infinite justice and holiness of God demand a ransom. In the Holy Sacrifice of Mass our Divine Savior offers Himself in ransom, and hence the holy Fathers teach that "many souls go forth from Purgatory every time that Mass is celebrated." 173. St. Chrysostom says, "As often as Holy Mass is celebrated, the angels of heaven hasten to open the prison of Purgatory." In this august Sacrifice the Body and Blood of Jesus Christ, this infinite treasure of satisfaction, is offered to the Heavenly Father for the living and the dead. The Suffering Souls themselves have repeatedly given testimony of this. Thus we read that in the time of St. Bernard a deceased religious of Clairveaux appeared to his brethren, thanking them for having released him from a long Purgatory. When asked what had brought him the greatest relief in his torments, he pointed to the altars, saying, "Behold, there are the weapons of divine grace by which I was released. There is shown the power of divine mercy—in the saving Sacrifice of the Victim that taketh away the sins of the world. "—Convinced of this truth the Venerable Cure d' Ars one day addressed his hearers as follows: ".Dear children, you remember the occurrence which I related to you of a saintly priest who prayed for a deceased friend. Very probably God revealed to him that his friend was suffering great torments in Purgatory. Knowing that there is nothing more effective to procure the repose of a soul than the celebration of Holy Mass, he proceeded to do so as soon as possible. Before consecration he took the host into his hands and addressed God with childlike confidence thus: 'Holy and Eternal Father, let us make an exchange. Thou dost hold captive the soul of my friend, and I have the power of changing this bread into the real Body of Thy Divine Son. Now, do Thou release my friend from Purgatory, and I will make to Thee an offering of Thy Divine Son, with all the merits of His passion and death.' And behold, after consecration, when elevating the sacred host, he saw the soul of his friend surrounded with glory entering heaven." 174. This saintly priest was well aware of the value of Holy Mass, this inestimable treasure of the Church, and acted most wisely in having recourse to this august Sacrifice rather than to other suffrages. St. Lawrence Justinian observes that one Holy Mass is to be deemed more valuable than all the penitential exercises of the whole world. He says, u Take the scales and place on one balance all the good works, viz. prayer, night-watches, fasting, alms-deeds, mortifications, pilgrimages, etc., and on the other only a single Mass, and you will find that the value of the one cannot be compared with that of the others; for in Holy Mass He is offered in whom dwells bodily the plenitude of divinity, as St. Paul observes, who possesses an immense treasury of merit, and whose intercession is all-powerful." The blood of Abel cried to heaven for vengeance, but the Blood of Christ cries for pardon. We have a type of this in the Old Law, where almost all the sacrifices were offered in blood, as St. Paul says, "For if the blood of goats and oxen, and the ashes of a heifer, sprinkled, sanctify such as are defiled to the cleaning of the flesh, how much more so shall the Blood of Christ, who by the Holy Ghost offered Himself unspotted to God, cleanse our conscience from dead works, to serve the living God? And therefore He is the mediator of the New Testament." (Hebr. ix. 13, 14.) And the prophet Zacharias says, 4 'Thou also, by the blood of Thy testament, hast sent forth thy prisoners out of the pit." (Zach. ix. 11 ) And in Holy Mass this Blood still releases the prisoners from Purgatory. 175. Blessed Henry Suso made a compact with a brother priest that if one of them would die, the other should for a year say two masses a week for the deceased. When after a few years his friend died, Suso prayed most fervently for him every day, adding fasts and exercises of penance ; but it was impossible for him at the time to say the promised Masses. After some days the deceased appeared to him with a sorrowful countenance and reprehended him sharply, saying; "Faithless friend, do you thus keep your promise ?" Suso called his attention to the fervent prayer and numerous penitential works which he had offered up for him. The deceased replied, "Your prayer, though pleasing to God, is not powerful enough to release me from my torments." And striking the table before him with his hand, he cried out, "Blood ! Blood! Blood is what we Suffering Souls stand in need of! The Blood of Jesus Christ which is offered up for us in Holy Mass is what will deliver us from our torments. If you had said the promised Masses I should already have been released from my fiery prison. It is your fault that I must still burn. Let me have the Masses, the Masses you have promised me !" 176. Christian soul! Let this cry of the Suffering Souls for the Blood of Jesus find a willing ear with you. Hasten to come to their aid by means of the Holy Sacrifice of the Mass. If we could but see with our mortal eyes how profitable and valuable a ransom Holy Mass is for the Suffering Souls, we would not refuse to have this Adorable Sacrifice offered up for their relief. But if you are not able to order a Mass for them, you can at least assist at Mass for this intention and influence others to do the same.—Once, when a poor widow complained to a saintly priest that she was unable to have Masses said for her deceased husband, he counselled her as follows: "Then assist at as many Masses as you can, and offer them for the soul of your husband; for he will find relief more speedily by having many Masses heard for him, than by having only a few offered up for the same intention. '"—This is a great consolation; for though it is more to have a Mass said than to assist at one, it is nevertheless a special comfort for the Suffering Souls if we offer up for them the Masses which we attend, and thus pour out upon them the Sacred Blood of Jesus. St. Jerome remarks on this subject, "The souls in Purgatory, for whom the priest celebrates Mass whilst the faithful offer up their prayers, are free from pain during the time Mass is said for them."